Learn how to make a fall wreath made with fabric scraps. A simple DIY craft tutorial idea that is perfect for hanging on the front door. Hey there, it’s me Sara again from Twelve On Main! I’m excited to be here once again contributing! 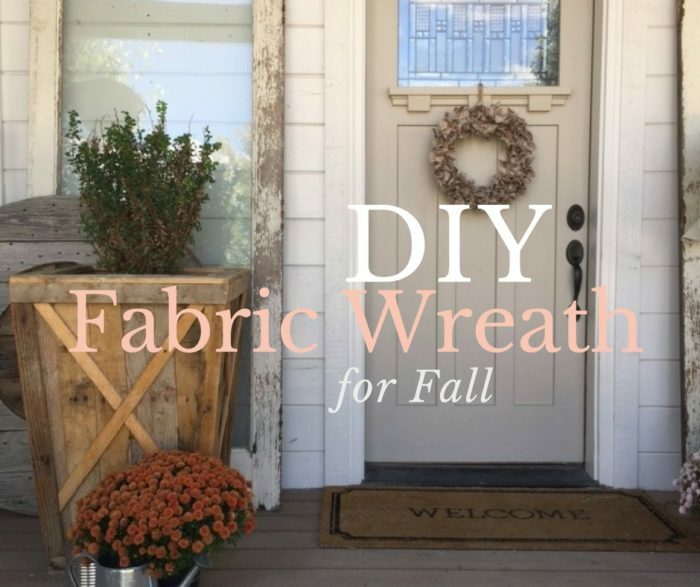 I’ve been so busy working on home decor and DIY projects for fall and I am excited to bring you one of my favorite projects today, a DIY fabric wreath for fall. Wire Wreath Form – you can use whatever size you want. I used a 14 inch. I ripped my fabric in about 1 inch wide strips and then cut them into 5-inch lengths. You want to start by folding one piece of fabric in half, folding it over the wire frame. Then feed the two ends of the cloth through the folded end of the fabric and then pull the two ends through, pulling taut. Repeat this over and over until the wreath is full. The more strips you add, the fuller it will be. This is preferably done while watching a little Jimmy Fallon, or perhaps some Fixer Upper. It’s important to keep yourself productive! You’ll be done before he interviews his second guest, that is unless you have to have a snack while you do it, then it may take just a little longer. Either way, just enjoy yourself. I used a plaid fabric that I found on sale at Joanns. It was on sale for 60 perfect off which is always fabulous. You can use any fabric you wish. This can make a really great addition to your fall decor. I’m so glad I was able to stop by today and visit with you all. I hope you’re having fun getting ready for fall and make sure to try this easy fabric wreath out! If you’re looking for some other fun fall wreath ideas, check out these from my blog at Twelve On Main. 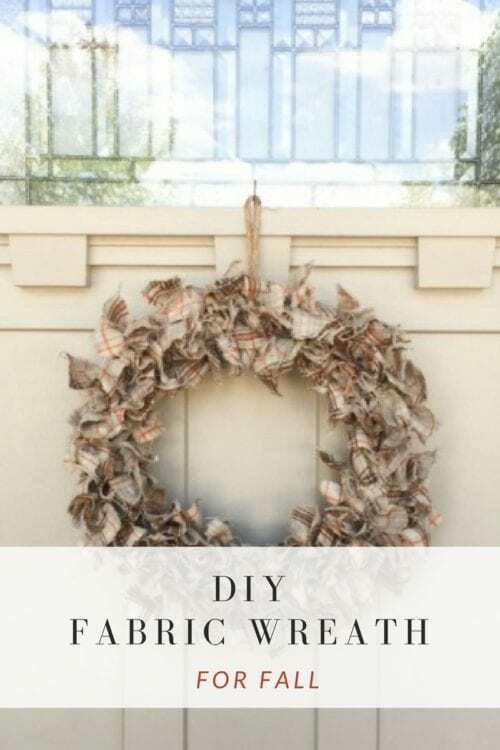 SAVE HOW TO MAKE A DIY FABRIC WREATH FOR FALL TO YOUR FAVORITE DIY PINTEREST BOARD! Have a great day and I hope to see you over at Twelve On Main! Thanks, Jasmine! I would love to see your wreath if you give it a go! I love this idea! Perfect for this time of year! Thanks for sharing at #SmallVictories linkup! Thank you Danita! I am so glad that you like it! This turned out so great and I love the fabric that you used! Thank you Valerie. I am so glad that you like the wreath! I love be the fabric you chose and ripping it is so perfect. Let Celt wreath! Thank you Dana! I am so glad that you like it! That’s a cute and affordable idea! Stopping by from Let’s Be Friends! Thanks, Christine! I am so glad that you like this wreath. I love that you can use any type of fabric to make the wreath match any decor or season. Love this DIY! Thanks so much for sharing!!! Thank you Cortne! I am so glad that you like this fabric wreath! Very cute wreath. Happy fall! I love a good fall wreath…any wreath really! This one is definitely a cute one! Well done! Thanks for sharing at Welcome Home Wednesdays! See you tomorrow! Thanks, Erin. I am so glad I could send some Fall Wreath inspiration your way.